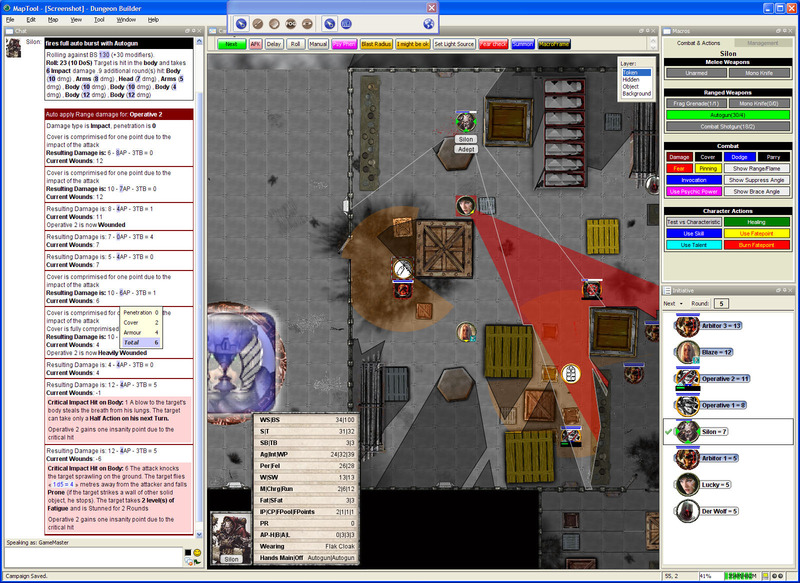 MapTool is a ruleset agnostic virtual tabletop that targets a wide range of uses. It has features to support face to face, projected, over the internet, and play by post games. It supports ad hoc as well as planned encounters. The map space does not have a limit in size and can support very, very, very large maps. It has a very advanced fog of war that incorporates vision and light. But most importantly MapTool has a very active and friendly community, which drives the features and development forward. There is typically a new development release every two weeks. MapTool is a Java-based program. You need to have a computer system that has Java 1.6 or later installed to run MapTool. Recent changes during work on the 1.3 version has made Java 1.6 a necessity. I've used this a little to gain some familiarity with VTs. I really like it. There are quite a few walk throughs and as you can see some videos too. It's main limitation is that there is no current way to block movement on a map. It is also quite memory hungry. There is an active community around it, and there is a built in scripting language (Macros), though I've not yet got into that side of things. It does make it look very powerful though. There's even a rudimentary database system built in so you can randomise things (random encounters etc).